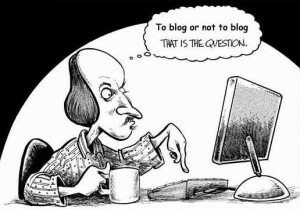 The real question is not about blogging or not blogging. Instead, KHS teachers wonder about the best way to transform blogs into powerful learning tools for their classrooms. Trying something new in your classroom? Write a quick blurb once a week in your blog about your experiment and elicit feedback from students, parents, and peers there as well. Asking your students to reflect on their learning and growth? Create a blog entry for the end of each unit where students summarize their learning, pose questions to peers about understanding they have not yet gleaned, and set goals for the next unit. Their blogs become a collaborative record of their risking, stumbling, and learning. Tired of being the terminal audience for student work? Extend the reach of student learning through your blog. Invite parents, librarians, local business owners, and other schools to take part in the conversation. If you have a blog, respond below with your name and URL so we can join in your learning. If you want to join the blogging movement at KHS, send me an email and we can make that happen!